Are you looking for the optimized profile presets for watching movie on your iPhone 5S/5C with high resolution? First of all, you need to know which video formats iPhone 5S/5C support, and then convert your video clips to iPhone 5S/5C playable format, and you are ready to move videos and movies from Mac 10.9 Mavericks to iPhone 5S/5C for playback on the move. What video formats does iPhone 5S/5C support? Have learned about the supported video and audio formats for iPhone 5S/5C, you need to search for a third-party video tool to assist you with converting MKV, AVI, VOB, TiVo, MPG, WMV, and Flash videos to iPhone 5S/5C MP4. Pavtube Mac Video Converter for iPhone 5S/5C is a professional yet easy-to-use video converting tool that helps you convert MKV, AVI, VOB, TiVo, MPG, WMV, FLV and more video clips to MP4, MOV, or M4V for iPhone 5S/5C with few clicks. Below is a full guide. 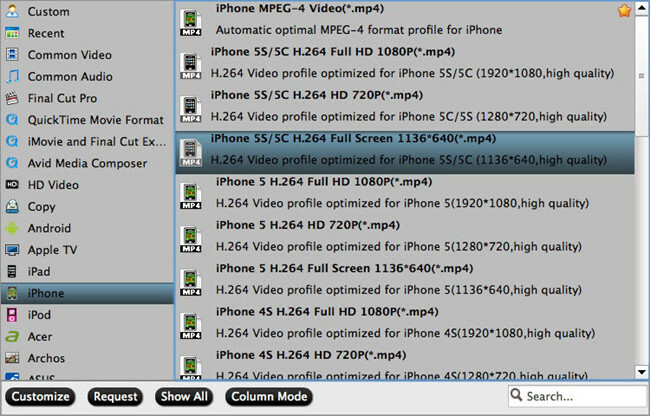 How to play MKV, AVI, VOB, Tivo, MPG, WMV and Flash videos on iPhone 5S/5C effectively? Mac Video Converter for iPhone 5S/5C is a piece of professional video converting tool that aims to help Mac users convert MKV, AVI, VOB, Tivo, MPG, WMV, FLV and many other videos to iPhone 5S/5C playable format. With a few clicks, you can watch these videos on iPhone 5S/5C while waiting for bus or subway. After successful installation of Pavtube Mac Video Converter, launch and import source video clip by clicking this “Add video” button. Or “Add from folder” to add more than one video at a time. From the drop-down list of “Format”, find “iPhone” category and choose the optimized profile for iPhone 5S/5C. 1. If you like, adjust profile settings such as video codec, size, bitrate, frame rate, and more to get better video and audio playback on iPhone 5S/5C. 2. 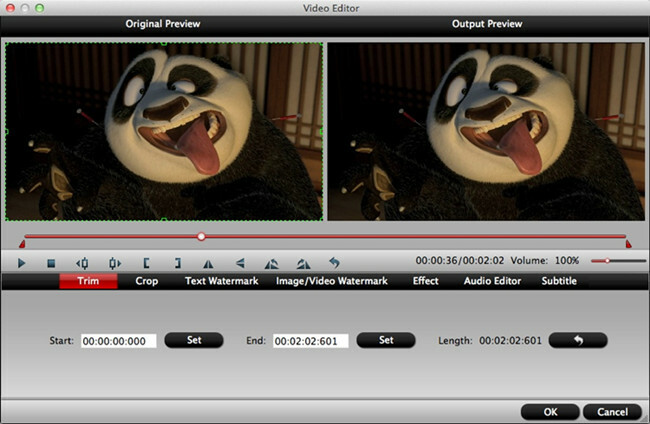 You are allowed to edit source video clip before starting the video to iPhone 5S/5C conversion. Tap the “Convert” icon to convert MKV, AVI, VOB, Tivo, MPG, WMV and Flash videos to iPhone 5S/5C compatible MP4 file. Once it completes, click on the output folder, get the generated MP4 file and transfer to iPhone 5S/5C via iTunes. How to upload videos edited in iMovie to Instagram? How to Upload Adobe After Effects video to Instagram? How to Import AVCHD Video to Final Cut Express 4.0?